reen computing or green storage – these terms are getting quite popular with an increasing number of carbon footprints and when we think of ways to prevent them. It is our duty to reduce the number of eco-footprints as quickly as possible and also to control the amount of them. Do you know that a single email generates a lot of footprints? A short email generates about 4 grams of CO2 equivalent to the atmosphere. When you send an email with a large attachment creates 50 grams of CO2. Even a text message, plastic bags, paper bags, bottled water, cappuccino, and large TVs, all generate a good amount of carbon footprint. I bet you were totally unaware of these impacts! So, these all reasons indicate that it is our prime responsibility to keep in check the number of carbon footprints getting generated. For this, data centers and other organizations are also getting on the ‘greener side’. They are opting for green computing and storage options now. Let us understand the terms one by one. 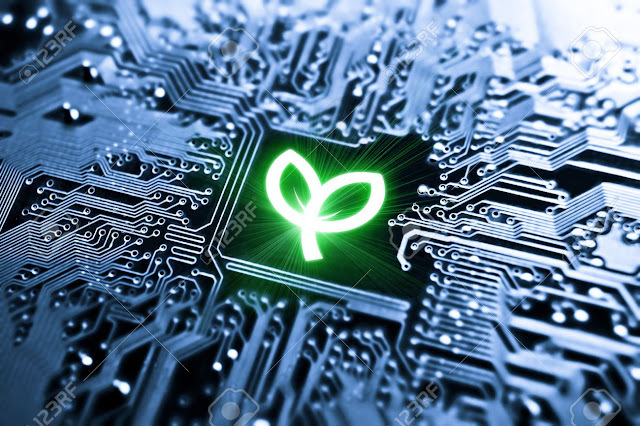 Green computing implies to the wiser, eco-friendly, and responsible use of computers. It also implies the study of manufacturing/engineering, designing, utilizing, and disposing of the devices in a proper way to reduce their environmental impact. Green computing is also known as green technology. · During the inactive time, we can shut-down the CPU and resources so that power is not wasted. · Computer related tasks shall be continuous and intensive time intervals so that hardware can be left off during other times. · Turn on and off the energy-intensive components/ devices like laser printers as per the need. · Using notebook computers instead of desktop computers can also help in the reduction of emissions. Old computers generate more carbon emissions than the newer ones. · A power-management facility shall be used to put off the hard drives when not in use. · We shall minimize the use of paper and recycling it properly. · E-waste disposal is also our concern and it should be according to the local govt. rules. · Whenever possible we can use alternative energy sources for data centers, networks, and workstations. To reduce the carbon footprints and costs of data centers, energy-efficient products and storage methods are widely in practice. This practice is called green storage which adds to carbon negativity. Carbon negativity means reducing the carbon footprints below than neutral levels so that the net effect becomes removing carbon dioxide from the atmosphere. •Do you know that tapes are still a popular solution for reducing carbon footprints? It is widely in use for green storage. A tape has no parts that use energy, it has more shelf-life than other methods of storages and it is portable. •One physical server has a tremendous capacity and hence it can have 20 virtualized servers on it. So, it is obvious that the efficiency improves and costs get lower. Therefore, you don’t need an overly expensive hardware. •SSDs i.e., Solid-state drives are faster and energy-efficient than mechanical hard drives. They are not very popular yet but they are gaining popularity gradually. There is only one issue and that is the cost as SSDs are expensive than other methods. •MAID (Massive Array of Idle Disks) systems can cut down energy use and prolong shelf-life but it only spins active drives. It makes drives inactive and this method causes performance limitations and due to these issues MAID systems are not popular. In Sept. 2018, there was a Global Climate Action Summit in San Francisco where 21 companies announced the beginning of the Step Up declaration. This alliance is meant to leverage the power of upcoming technologies. This is also a fourth revolution in the industry which is for reducing greenhouse gas emissions by 2020 in all economic sectors so that the environment becomes healthy. New architectures have been introduced which focusses on optimization of shared resources, data center power, cooling systems, and refresh cycles. This is an innovative approach which emphasizes on re-use of system enclosures, enabling of a modular refresh of sub-systems and utilizing extended optimized life sub-systems. Further, it also includes storage, networking, power supplies, fans, etc. When resource saving architectures are implemented, the datacenters can have evident positive changes like 47-60% savings in the costs of hardware refresh because of the disaggregated server architecture. Also, there is 32% improvisation in PUE (Power Usage Effectiveness) with free air cooling. Further, there are 60% savings in the costs of HVAC combined with pooled resources which help in configuration/engineering and dynamic allocation of crucial data center resources. By using these green computing and green storage techniques, data centers can reduce carbon emission and footprints by using less electricity, also they can be more efficient on energy, and save costs on expensive hardware and repair costs. There are going to be continuous and periodic innovations and discoveries in technologies which can help in reducing environmental issues. We just need to learn about the most effective and efficient power consumption and cooling practices. These methods can result in the lesser consumption of energy and costs which is great for us and the environment, both. It all starts with consciousness and everyone’s desire to contribute to society.